This training tip is so simple it almost seems silly to write about it, but some dog owners might not realize how effective this positive training technique can be when training a new behavior. Leading your dog by the nose means you’re using your pup’s primary sense, his sense of smell, to motivate him to learn more quickly. What’s the motivator? Food, of course! 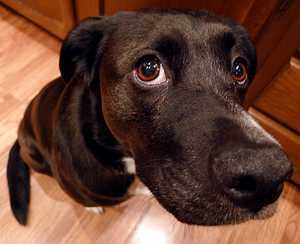 Let’s face it, all dogs have to eat and most are highly motivated by treats or tasty food. The trick isn’t just giving food as a reward, it’s using the food to direct your dog’s body movement from their nose while learning a new command. By holding the food close to their nose, without letting them grab it, they’ll usually follow your hand into the desired position while you give a verbal command or hand gesture. Soon, they’ll make the connection between the action and the verbal command. Here are a few examples. Sit Command– The treat is held close to your dog’s nose then raised slightly. As your dog follows the treat upwards, his backend will automatically lower into a sitting position. To learn more about teaching the Sit command, check out my post The Most Useful Command to Teach Your Dog. Down Command – From a sitting position, the treat is held close to your dog’s nose, then slowly lowered as your dog follows the treat to the floor and lowers himself into a down position. 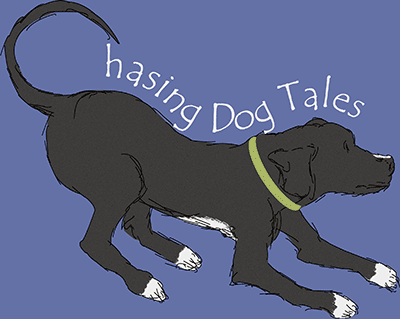 Read How to Teach Your Dog the Down Command to learn more. Roll Over – From a down position, lure your dog’s nose up and around so he’ll follow the treat with his nose and roll over. Here’s Haley following her nose while demonstrating the Down command. When some people train their pups, they hold the treat close to their body as if to say “This is mine until you hold up your end of the bargain”, but in the examples above, the treat is held close to your dog’s nose and only given when he follows through with the command. For commands that direct a movement, this can be a powerful training tool because it enlists your dog’s appetite as well as his strong sense of smell. It’s also important to give lots of praise when your pup is successful when learning the new command. Isn’t That Bribing My Dog to Comply? Maybe, but only when you’re first starting to train the new command. Let me explain the difference between a bribe and a reward. A bribe is given before or during a behavior to lure your dog into following a command and a reward is given after the dog performs the desired behavior. 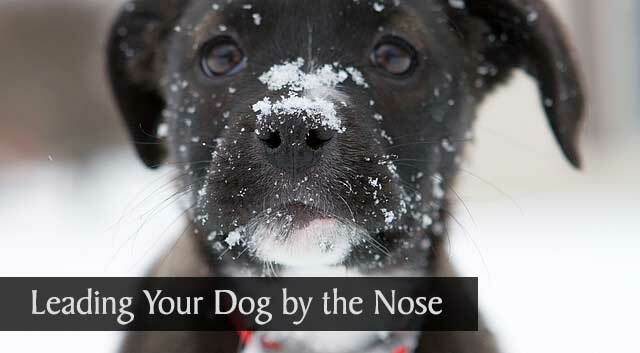 With this technique, you are luring your dog by his nose into a position, but only giving the treat as a reward if he follows through. Once your dog starts to catch on to the associated verbal command or hand gesture, you’ll start holding the treat further away until eventually he’ll follow the command without seeing the food first. After that point, you’ll transition to intermittent rewards or use others types of non-food rewards, such as praise, affection or playtime. Other ways of rewarding your dog can be to ask him to sit before getting his meal, going outside or playing a game of fetch. Even after your dog knows a command well, there’s nothing better than an occasional, unexpected food reward to help reinforce good manners and listening skills. Won’t My Dog Get Fat? There are several ways to use food as a reward without adding a lot of extra calories to your dog’s diet. If you feed your dog kibble, you can just take a portion from their daily meal to use as training treats. You can also purchase small, low-calorie training treats from your local pet store or use small pieces of meat or cheese. Remember, you’ll be working towards intermittent treats and eventually using other non-food types of rewards too. Does This Technique Work With all Commands? No. There are some commands, such as the Stay command, where holding a treat will be counterproductive since a dog’s instinct is to move towards something that smells yummy. In this example, it would be better to keep the treat in your pocket or out of sight until your dog performs the command. Leading your dog by the nose uses food along with your dog’s appetite and sense of smell to make training success quicker and easier. Food can be a powerful reward and reinforcer of behavior for your dog and even though this technique is kind of like having a canine magic wand, you’ll want to make the transition from bribe to reward fairly quickly. What’s your experience with using food or treats when training your dog? Love seeing videos of others training their pups. Always learn new tips and tricks along the way. Videos really help when trying to explain a concept, don’t they? It seems you can learn to do almost anything from YouTube videos, lol! Aw, thanks Hazel! I can just imagine Happy running through all his tricks thinking, “I’ll do anything for that!” Haha ? That’s pretty much the way we learned our commands as little pups. Sometimes Mom just carried part of our kibble around and would have us work for that during the day. Puppies don’t care much what food they get in the early months. That’s great you all work for kibble. You guys are the masters of nose work too! ? We are working on it … probably always will be! BOL!! I know the feeling, Jeanne. We’re always working and reinforcing things around here too. The perfect dog would be quite boring, right? ? Great tips and advice. Your tutorials really helped me. Thanks for the post! Thank you, Melinda. ? I’m glad the post was helpful! These are excellent tips! Were working on “wait” in the a.m. when we feed breakfast. Everyone has to wait or stay for at least 60 seconds before they can eat. Great post. I love that idea! What a great way to keep their attention and practice patience and good manners. ? This is how I taught my puppy to twirl! I think I learned how to do it from your blog. Bailey sniffed the treat I put close to her nose and started to follow it around in a circle. Your video tutorials are very helpful. It is kind of like having a magic wand, isn’t it? Thanks for stopping by today and for your kind words. ? Mom Kim here – I am thankful most Beagles learn by leading by the nose – are treat motivated. So many people struggle to train their dogs but once the owner learns what is it that motivates their dog to learn then it is amazing how quickly a dog can pick up obedience skills. Both Angel Shiloh and Lady Shasta have their CGC’s and both were trained to be therapy dogs – all taught through training with food. So much easier for both human and dog once the way to motivate is figured out. And it is always good to use refresher commands – I am using both vocal and hand signals with Lady Shasta. Love your video – love to watch dogs in action. I also wanted to thank you for stopping by our blog and leaving your cooment of support and prayers. You’re so right about finding the right motivation. Luckily, for most dogs it seems to be food, lol! Some people think scent hounds are independent and harder to train, but it’s clear that with the right teacher and motivation, they’re just as willing to learn and even more so than many other breeds. All those CGC certifications are good proof! Thanks for stopping by today too and I’ll continue to keep you in my thoughts and prayers. ? 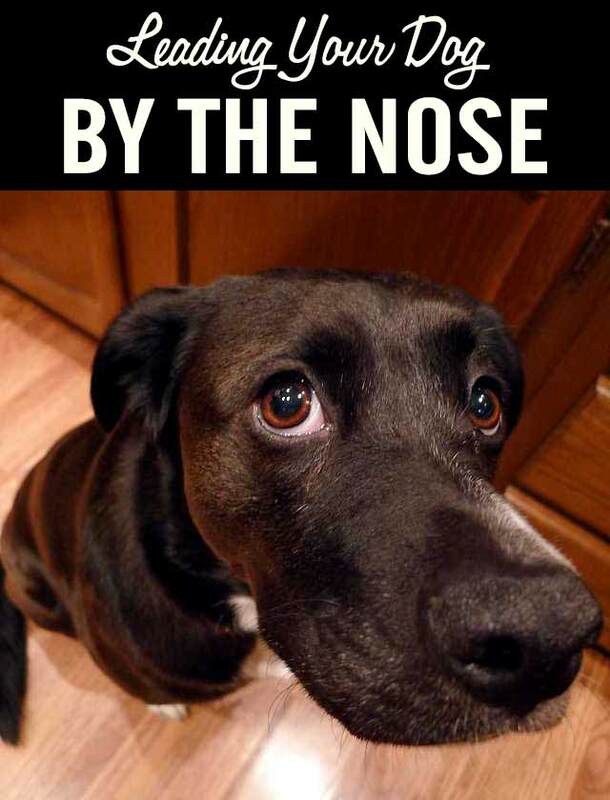 This is great post for new pet parents to understand how to use their puppies nose to their advantage when training. It is always a good to state what may be obvious to us dog bloggers and dog trainers. However, new pet parents that have never owned a dog before this post is a perfect starter kit. Thanks so much for sharing. I’ll be sure to share this post. Thanks Suzanne and I really appreciate you sharing the post! ? Love the video. She’s so cute! We use hand gestures for Rita as well for sit, down and stay. I’ve never had any luck with roll over with her! My other dogs learned it so easily with the ‘lead by the nose” technique, but not Rita. Maybe I need to try a higher value treat! Or maybe she just doesn’t wanna! Tell Rita she’s not alone. Haley will rollover but it’s her least favorite thing to do, except getting a bath. ? You brought up a great point under “Won’t my dog get fat?” I’ve volunteered at several assistance dog organizations raising puppies. One school is very strict with food rewards asking us to portion off some of our pups regular meals and use that portion for rewards during training. Unfortunately this has not been the case with all schools as I saw one of my puppies go in for advanced training and after only 8 weeks she was 14 lbs heavier! Whoa, it sounds like someone was very generous with the rewards there. Haley’s one of those dogs that won’t work as hard for dog food, but when using treats or people food, she’ll do just about anything even if the piece of food is really tiny. I used treats to teach the dogs to give high 5s and high 10s. They wanted the treat in my hand, so they dug at my fingers. Perfecto! In general, I think treats work best in combination with a clicker. But I love them. Wouldn’t train without ’em! What a great way to teach high-fives, right? I’ve haven’t used a clicker yet when training Haley, but I might try one because it would probably work well for more advanced types of tricks like learning to close a door with her nose. You’re so right, most dogs love food! I use this method a lot and it’s worked well for me. I’m hoping to teach my little dog to roll over using this method. Good luck with Phoebe’s roll over! You’ll have to let me know how she’s doing or post a video. ? Hi there! We are stopping by to wish you all a very Happy St. Patrick’s Day!! Thanks so much and a very Happy St. Patrick’s Day to you too! ? That’s a great idea! I should try that when Haley gets distracted and comes to a dead stop on the leash. Sometimes she can be pretty stubborn when she comes across an super interesting smell. We have been looking for that treat that Cocoa is crazy about. She is not super food motivated but there has got to be a food out there that she loves and will do anything for!! I know with Haley, dog food is okay, treats from the pet store are much better, but people food is the best! Hot dogs, chicken, cheese, beef jerky, etc. Maybe you’re lucky though if Cocoa is more play or affection motivated because she’ll probably stay in great shape and you won’t have to worry about her gaining any extra weight. We have always used this method to teach our pups the heel position. We put the treat right at their nose and let them nibble a bit now and again. It is hard on the back, but it really works. Thanks for that great tip, Linda. I’ve always given Haley a small treat and then she usually goes back out in front, but letting her nibble a little bit at a time would work much better. I’ll be trying that after Haley heals up from her knee surgery. ? Ah, “stay…” my dogs are SO good at “stay” (as proven by almost every single photo on my blog) except when we go to to pet shops, pet events, photo shoots, etc. and they are suddenly surrounded by people with treats in their hands. I try to explain that they will “stay” if no treats are involved and I get “she must be crazy” stares. *sigh* Maybe I will try explaining how dogs like to follow their noses! That’s the secret to all of your amazing photos! I’ve always been so impressed at how you can pose all the dogs and they always look so cooperative. ? I find treat luring is very effective for many dogs–if the trainer is good with her hands. Personally, I’m not so hot at it. I never manage to get my hands in the right place to encourage the behavior I’m trying to teach. I’ve also found that Honey is very interested in the smell of catnip. I wonder if her curiosity about the scent, even though it’s not a treat, would work as an effective lure. That’s so interesting! I think I’ve heard catnip is relaxing to dogs so as long as it doesn’t put Honey to sleep, I say give it a try, haha! Exactly how we taught Jack & Maggie ‘down’. The nose knows. Haha! I almost titled this post “Only the Nose Knows”. Great minds! ? Oh yes, I taught the sit, down, and roll over using tasty, bite-size treats 🙂 I reward a longer down-stay (by the open front door, for example, or when the door bell rings) with a larger treat, such as a dehydrated duck foot. You know…maybe just maybe, a duck foot would work for Haley when I want her to stay after the doorbell rings. I’ll work on that one and let you know how it goes, Barbara! ? This is how I teach my pooches, great job! You can’t argue with all the success you’ve had while raising and training all your wonderful Chessies! ?